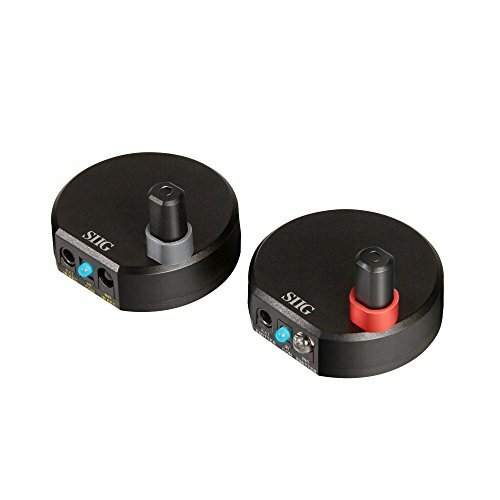 SIIG's Ultra Compact Wireless IR Remote Control Extender Kit is designed to extend Infrared signal distance wirelessly for IR-equipped devices for maximum flexibility of device placement. It allows you to station your source device from the display unit up to 656ft (200m) away while providing long distance remote control capability. Extended compatibility enables this extender kit to work with most infrared operated electronics such as DVD players, cable boxes, satellite receivers and audio/Hi-Fi stereo systems. Real time signal transmission without delay technology ensures smooth and continuous data transmitting. It is a reliable wireless IR extension solution to extend standard IR signal limitation to long-range signal distance. WIDE COMPATABILITY: IR receiving module recognizes IR signal frequency ranges from 20 to 60 KHz, compatible with most IR-equipped devices such as DVD players, cable boxes, satellite receivers, audio/Hi-Fi stereo systems, etc. HASSLE-FREE INSTALLATION: Ultra-compact design with bundled infrared extension cables allow easy and flexible placement. Please keep in mind to place the extension cables in line-of-sight of the source IR sensor no further than 2 inches for best signal. NOTE: We recommend using the kit without the IR extension cables. Simply placing the Receiver Unit in line-of-sight with source device can support longer range. Only use the extension cable if needed. Contact us with any questions.